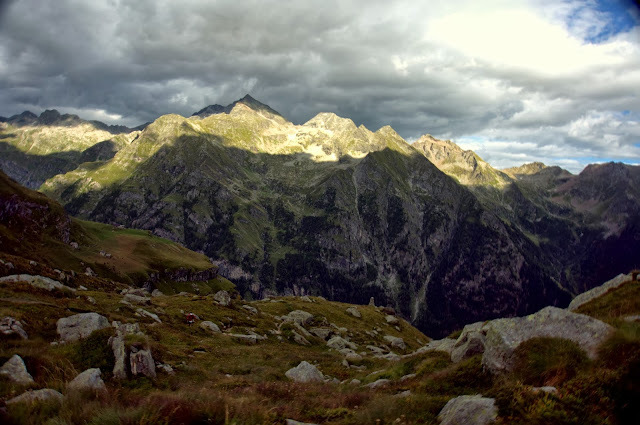 Ah, the Aosta Valley. An idyllic strand of old-world villages and modern adventure hubs woven together beneath the towering spires of the Italian Alps. What better place could there be to revive tired legs and splintered spirits? As we boarded an early-morning flight from Dusseldorf back to Geneva, I was still feeling broken from PTL. Still, I hoped some good, old-fashioned mountain awesomeness would propel me through a week of intensive race crewing and active sight-seeing. Then, of course, there's Beat. Crazy, crazy Beat. I used to believe we had similar levels of passion and drive for this sort of stuff, but his crazy is many notches beyond mine. While I was still wondering if I would find the heart and strength to climb to the top of just one col in the Italian Alps, Beat was setting out to march over 25 of them in the 200-mile, 80,000-feet-of-climbing Tor des Geants. 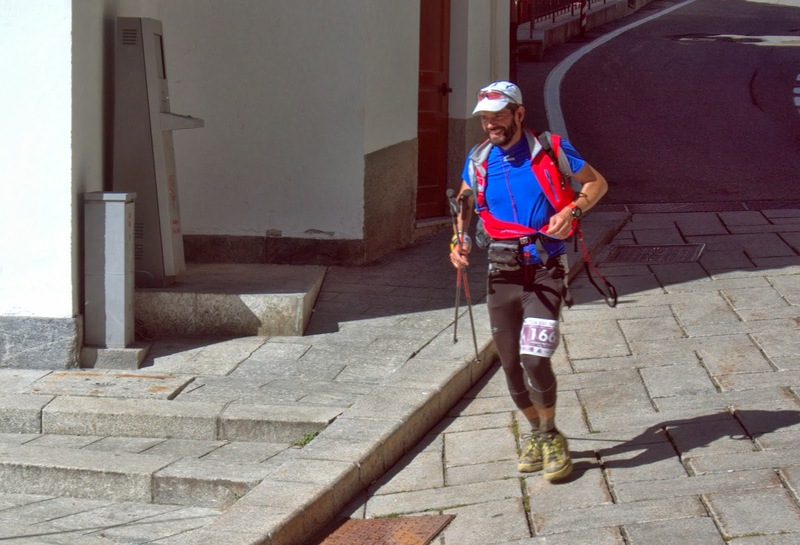 It would be his fourth such trip around the highline of the Aosta Valley, and his second PTL/TdG double-header. 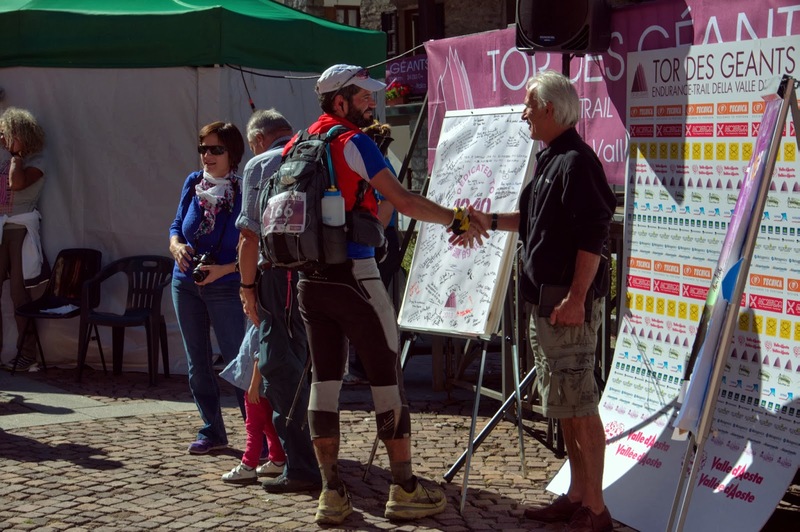 The Tor des Geants starts and ends in downtown Courmayeur, an Italian village at the tip of the Aosta Valley and base of Monte Bianco. Courmayeur reminds me of a medium-sized Colorado mountain town (like Telluride) but with old-world flavor: Stone buildings, cobblestone streets, and sheep farmers on the outskirts of town. 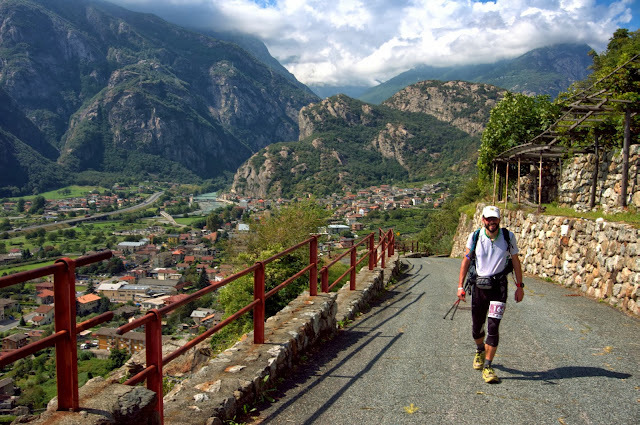 Every street corner has a restaurant with incredible pizza and/or gelato, and every major street seems to end at the trailhead of some brutally steep and fantastically beautiful trail. I love Courmayeur and was thrilled to spend a whole week there, even under semi-broken circumstances. The TdG was slated to launch at the delightfully civilized hour of 10 a.m. Sunday morning (and didn't actually start until closer to 10:20 a.m. — gotta love the Italians.) 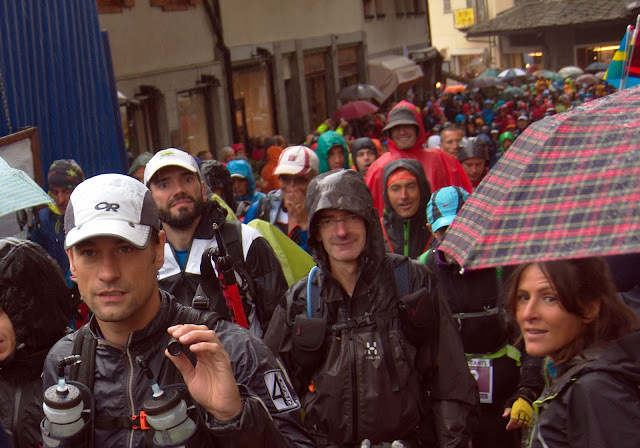 About 750 runners started the 330-kilometer journey under light drizzling rain and temperatures in the high 50s. Our friend from Colorado, Daniel Benhammou, visited Courmayeur over the weekend to hang out and watch the race start on Sunday. Daniel was Beat's PTL partner in last year's race, and was all set to be part of Beat's team this year before a death in his family prevented him from racing. 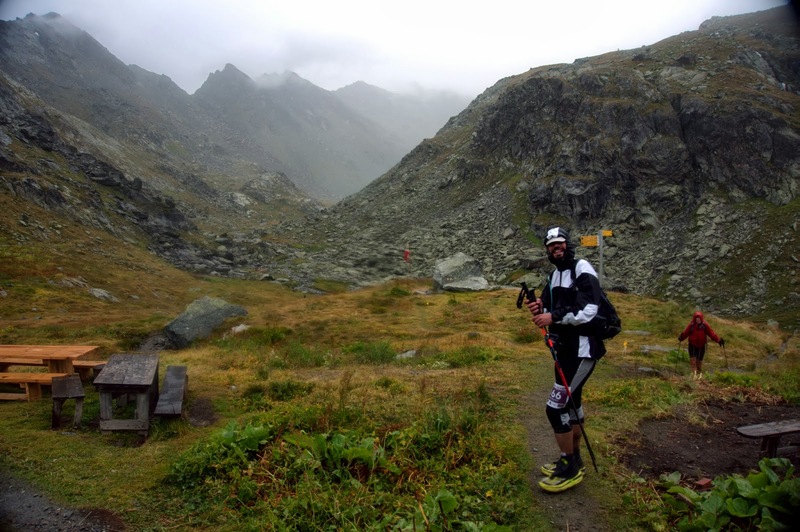 He was in Europe on business and still bummed about missing PTL, so his trip to Courmayeur was filled with what adventure types call "FOMO" (fear of missing out.) It was fun to spend the day with him and absorb some of his stoke about the Tor des Geants. Sadly, I was still full of grump and spent entirely too much time trying to convince Daniel that I had no fun at all at PTL. As we drove up the canyon to La Thuile to meet Beat at the first checkpoint, I gestured toward the high ridge where Ana, Giorgio, and I separated during PTL, and then pointed out Elevaz, the village where I emerged from my psychotic meltdown. Still, Daniel was unconvinced by my assertions that PTL was a terrible experience. "Ah, you loved it," he teased me. "Give it some more time. You'll want to come back next year." Daniel and I parked in La Thuile and started wending our way up the canyon trail, which ascended a steep rim beside a series of waterfalls. We thought we'd climb most of the way to the pass before returning to meet Beat, but thanks to a lot of dawdling on both of our parts, Beat caught us before we even left the last village. I thought he was making great time for the first 30 kilometers, but he looked rough and said he wasn't feeling well. A chest cold and accompanying congestion and pain was bothering him quite a bit, and he was generally just run down after PTL. Well, of course. But these kinds of physical setbacks are just par for the course for Beat these days. He felt downtrodden, but not hopeless. Daniel and I followed Beat on the little 1,200-meter climb to Rifugio Deffeyes (because in TdG, 4,000-foot-plus ascents are also just par for the course.) Thunderstorms battered us with fierce rain and hail. We could see them approaching the way you can in the Rocky Mountains, and Daniel, with all of his Colorado experience, was great at guessing how many minutes away the thunderstorm was, and just how bad the cold deluge would be. Daniel also wore shorts and a T-shirt the entire time, and chatted breezily in French with passing hikers. 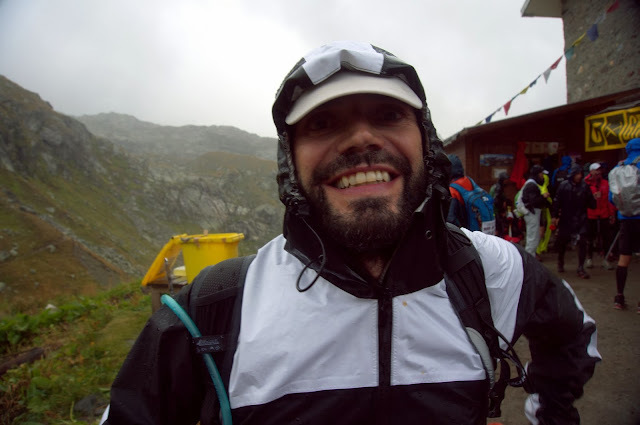 As Beat continued higher into the storm, Daniel and I treated ourselves to refreshments at the rifugio. Two wonderful cappuccinos and wild blueberry pastries, served in a hut accessible only by foot and helicopter, cost only eight euros. I love Italy. By the time we left, Daniel was shivering and ready to admit he was actually very cold and wet. We ended up all but running down the steep descent as Daniel pushed to warm up and I pushed to keep up. As we descended, we encountered my PTL partner Ana, who was also nutty enough to start the TdG. She said her blisters were worse than bad, and she was "suffering." I felt a tinge of regret. "Why do we do this to ourselves?" I wondered, mostly about Beat and Ana. But I was nowhere near their position, and I couldn't begin to answer that question for them. I wrapped my arms around Ana and told her about the amazing blueberry pastries and warmth at the rifugio. It was, sadly, all I could do. I drove out to Cogne early because I wanted to embark on the climb to Col Loson, which is my favorite section of TdG (that I've seen.) The trail ascends from 5,000 feet altitude in Cogne all the way up to 11,000 feet at the pass on mostly reasonable grades (with the exception of 1,000 feet of near-vertical hell), and has incredible views the entire way. Thanks to the late night at Valgrisenche, I'd only slept about four hours after becoming accustomed to ten to twelve hours of sleep every day in Germany. The first hour of the climb was especially rough, and it made me ponder how exactly Beat was managing this huge undertaking. When I met him just below the pass he was smiling. And running! He was feeling so much better after that second frigid night on the mountains. I was baffled. 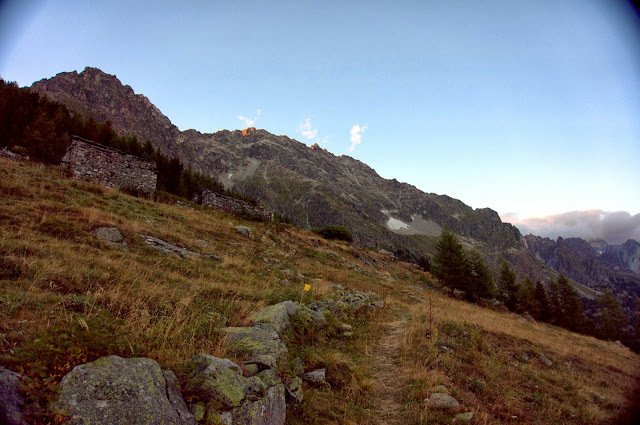 I hiked with Beat for about 90 minutes beyond Donnas before I had to turn around and drive back to Courmayeur so I could work all through Tuesday night on deadline. During this night, I got quite sick — vomiting, sore throat, and what felt like a fever. But, sigh, no complaints. How was Beat managing all of this? For Wednesday, I'd invited my friend Gabi, who lives in Zurich, to join me on the trip to the fourth life base, Gressoney. Gabi has participated in TdG twice and had to drop both times due to pulmonary congestion. Last year, TdG doctors pulled her out of the race at Gressoney because of concerns about pneumonia. Gabi had never been beyond that point on the course. "Come out to Italy on Wednesday and we'll hike with Beat to Col Pinter," I told her. Yeah, it's only another 5,000-foot climb, and most of that elevation gain is crammed into a measly three miles. I was still sick, but I did talk Gabi into traveling all the way out there. Time to rally. Beat, for his part, was only becoming stronger as the miles dragged on. I'd finally gotten some lunch down the hatch (pizza, of course) and felt considerably better as we followed him on the five-kilometer river path out of Gressoney. But as soon as the climb began, both Gabi and I had to work hard to keep Beat's pace. He was moving well and passing a fair number of TdG racers. It was 3 p.m. when we left Gressoney, and cold air was beginning to settle in as the sun sank lower on the horizon. Although skies were clear, temperatures hadn't even skimmed 10 degrees Celsius during the day, and were projected to drop to -5C at night with windchills around -13C. The cold remained for the rest of the race, and the weather seemed to take its toll on runners, who often arrived at life bases looking half-frozen. Beat, of course, took it all in stride. 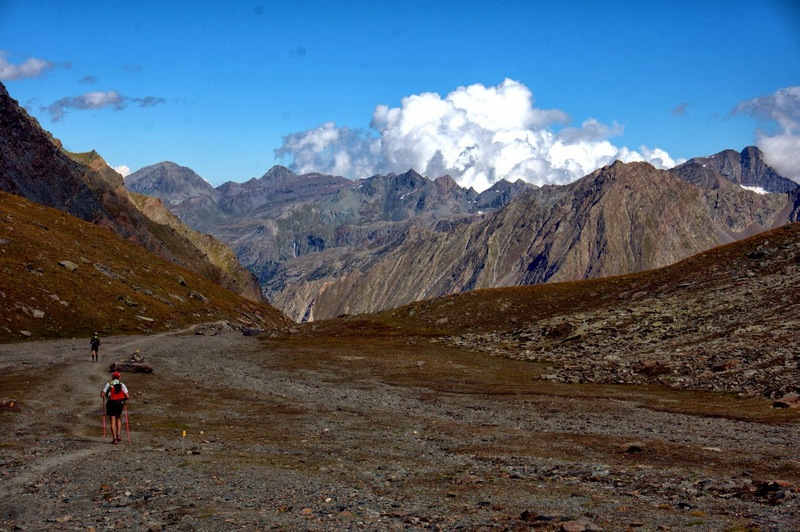 We bid goodbye on Col Pinter, elevation 2,776 meters, and then Gabi and I turned around for the long descent. As we descended, I tried to explain the disparity in the difficulties of PTL versus TdG. "It's not just the navigational aspect," I said. "That's hard. 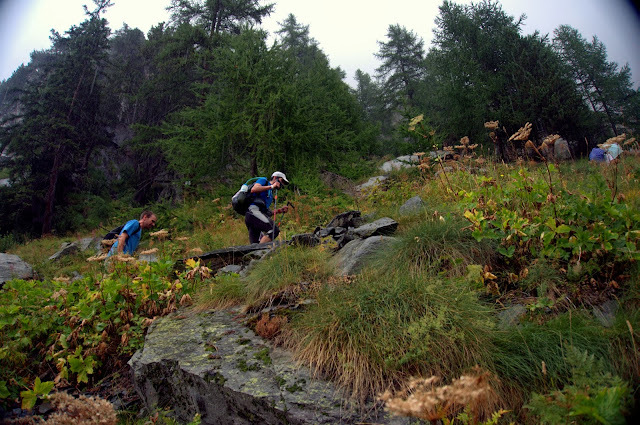 But it's the terrain that really makes PTL tough to finish. 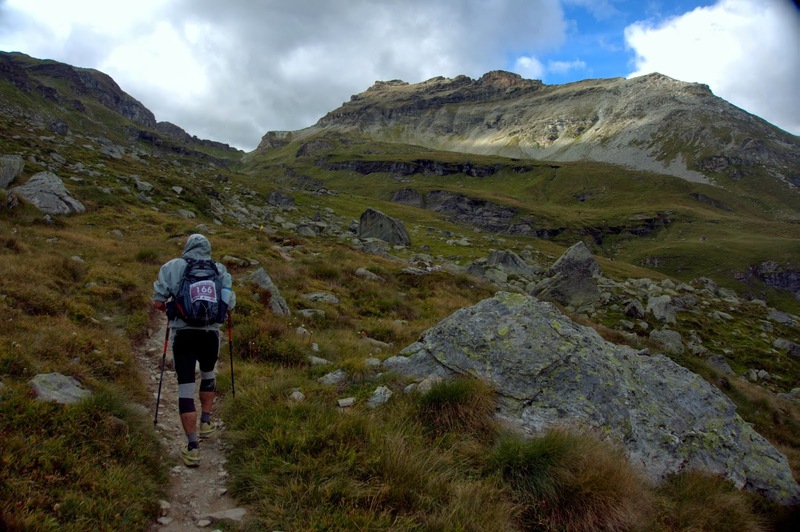 Admittedly I wasn't as fit as I should be, but all the fitness in the world isn't going to help you much unless you have a fair amount of mountain scrambling experience and aren't afraid to move fast on sketchy terrain." Since we were working our way down a pass that had nearly 10,000 feet of elevation change in six miles, Gabi wondered how PTL terrain could possibly be harder. I pointed to the trail we were on. "See how we're on this nice trail. It's steep and loose and rocky, but it's defined; it carves a walkable surface. That's TdG." Then I pointed to the avalanche gully directly to our right, a steep rockslide of boulders and loose scree. 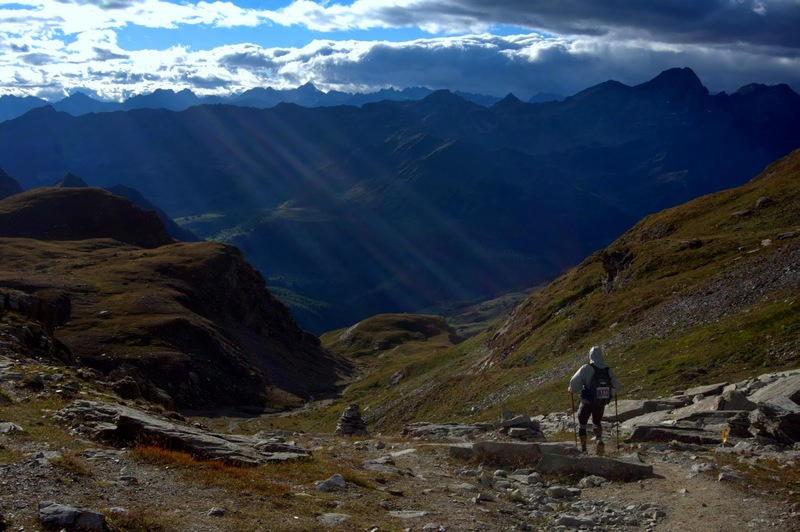 "If there was no trail and we had to climb straight up and down that, that's PTL. Not all of PTL, of course. But enough to matter. It's the difference between moving 3 to 4 kilometers an hour with medium effort, like we've been doing, and 1 kilometer an hour at strenuous effort for the same distance and elevation." Darkness fell by the time Gabi and I reached the river. 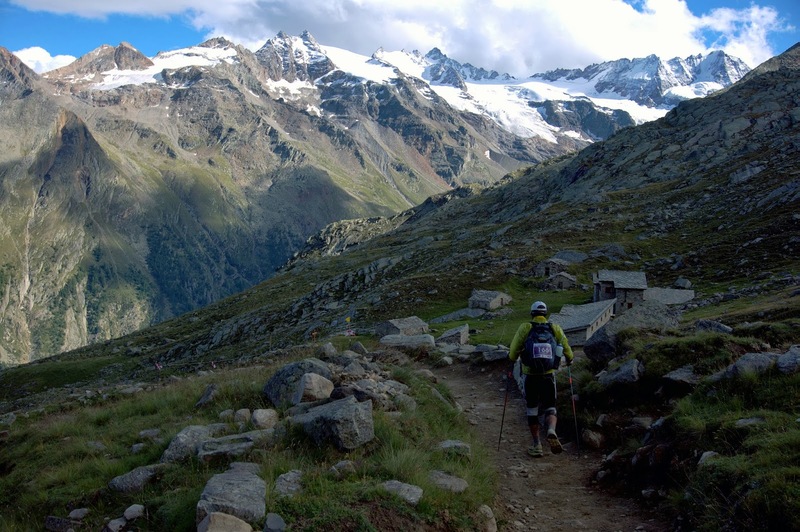 About a half mile from Gressoney, we encountered Ana, who was traveling with a Canadian woman named Claire. 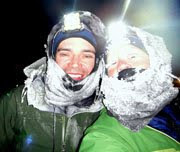 Gabi and I accompanied them for four kilometers back to the base of the climb. Claire was chatty but Ana was quiet, understandably, so we didn't learn much about how she was doing. "I'm curious about how Ana is coping with TdG emotionally," I told Gabi later. "Only because I have more knowledge of what her PTL experience was like compared to Beat's, and honestly, I'm still a bit shell-shocked by the whole thing. I wonder if Ana feels similarly about it, and I wonder what it's like to put herself through it all over again. For sure, Ana is tough. I don't think I've ever met another woman who's so mentally tough." Gabi and I didn't make it back to Gressoney until 10 p.m. We didn't bring much food with us, and next on the agenda was driving straight to Valtornenche to wait for Beat. I was particularly bummed about no dinner, and Gabi suggested we wander deeper into town. Gressoney is a tiny village whose population can't be more than a few hundred, and September is the Aosta Valley's off-season. Still, we came across a small restaurant that was open until 11 and served reasonably priced fresh polenta and gigantic lettuce, carrot, and tomato mixed salads. Fantastic. I love Italy. My plan was to park the small rental car at the life base and sleep for a few hours in the back, as there wasn't enough time left before Beat's arrival to drive all the way back to Courmayeur. 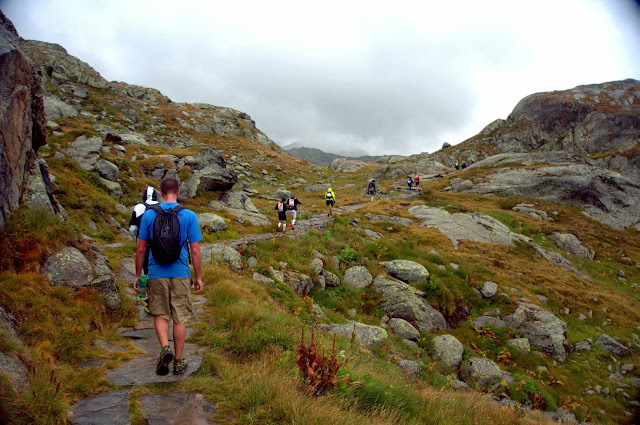 Unfortunately, I didn't have any blankets or really anything more than a spare coat to stay warm, and the temperature dropped to 1 degree Celsius by the time we arrived in Valtornenche. The TdG doesn't provide accommodations for crew — you're not even supposed to wait in the tents — so we were stuck. I was exhausted and slept for about 40 minutes before I shivered myself awake, but poor Gabi was especially miserable. She decided to go wait in the tent while I stubbornly opted to stay in the car (I'm self-conscious about being unwelcome as a non-racer.) After about 20 minutes I woke up again with completely numb hands and feet. It was concerning enough that I went for a run through the streets to bring the circulation back to my limbs. Then I continued to lie in the car and shiver until Beat arrived at about 4 a.m.
Gabi had planned to stay another night, but when I warned her about another frigid overnight wait at the final life base, Ollomont, she booked the first train back to Zurich on Thursday. I don't blame her; it really was miserable, and I had become ill again, so I wasn't optimistic about embarking on any more hikes. We didn't make it back to Courmayeur until 10 a.m. and I was back on the road to Ollomont at 4 p.m. after more vomiting and little sleep. Honestly, it was brutal. But I had done it to myself. I expected to arrive at the village of Close around the same time as Beat, but when I looked around the checkpoint, I couldn't find him, and also didn't see him as I sat outside to watch racers come in (as it turned out, he was napping inside at the time.) I decided I must have missed him, so I grabbed my pack and started power-hiking up the next pass, Col Brison. I was nauseated and hiking harder than I should in a hopeful effort to catch Beat. 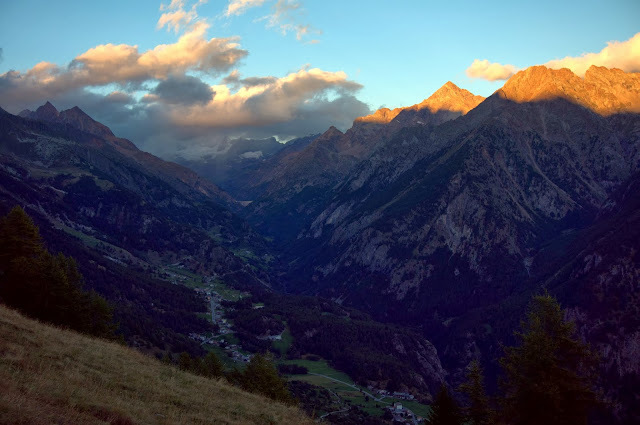 Common sense told me to just turn around as it was getting dark and I was too sick to pleasure hike, but I still held on to the attitude that "I'm only in the Aosta Valley for a few more days so I might as well soak up as much as I can. Rest can happen next week." But Col Brison proved to be my unraveling. By the return trip I felt nine-tenths shattered. As it turned out, Beat had been behind me, and I intercepted him on the steepest part of the pass. Although I felt awful at that point, I decided to join him for some of his climb since my whole intention in going to Close was to hike with him. Beat was also very tired and we climbed in silence for about five minutes before he said, "Wait, am I hallucinating you?" After about 25 minutes I had to turn around so there would be enough time to hike down and drive all the way around this huge mountain to meet him in Ollomont. The Ollomont stop also kept me out until the pre-dawn hours, and when I returned to Courmayeur at 5 a.m. I was quite ill, yet again. The entire time I was in Italy, I felt like I was operating on meager strands of energy reserves that I'd managed to restock through whatever sleep I could grab. But once those reserves were spent, I was fully spent. By Friday morning I was nearly as bad off as I'd been two weeks earlier when I dropped out of PTL. There had been hopeful plans to join Beat on the final big climb of TdG — the stunning 9,600-foot Col Malatra — but there was really no way to make it happen. Honestly, someone could have offered me a check for $5,000 to climb that pass and I would have regretfully turned them down. My body outright refused and then locked me in the bathroom for good measure. It was impossible. And then there's Beat. Crazy, amazing Beat. His strength only increased as the long miles and sleepless nights dragged on. His chest cold had improved and his throbbing feet went partially numb, and he started running. He texted me on Friday morning from St. Rhemy a full two hours before I expected him to get there. Over the next six hours, he marched swiftly up Col Malatra and then ran most of the way down, a 6,000-foot descent over 11 miles into Courmayeur. 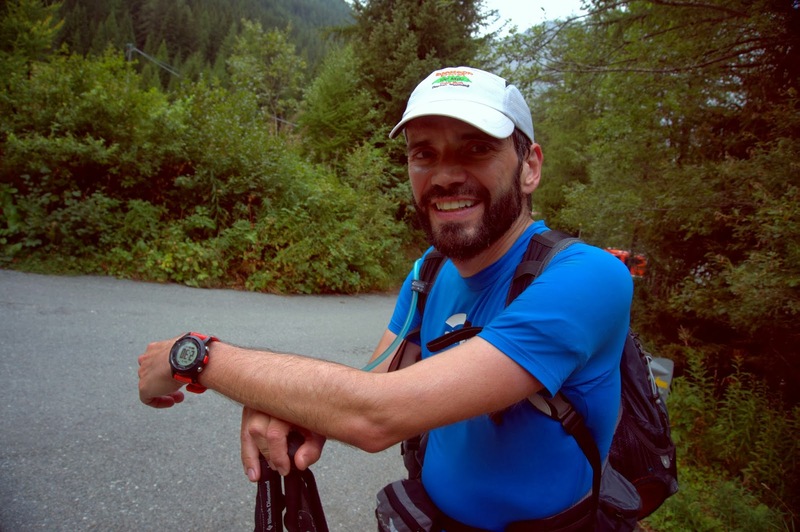 In the final 50 kilometers of TdG, he moved up more than 35 positions in the standings, finishing in 140th place out of 750 starters and 383 finishers. His time of 125 hours, 14 minutes and 19 seconds was his fastest yet. 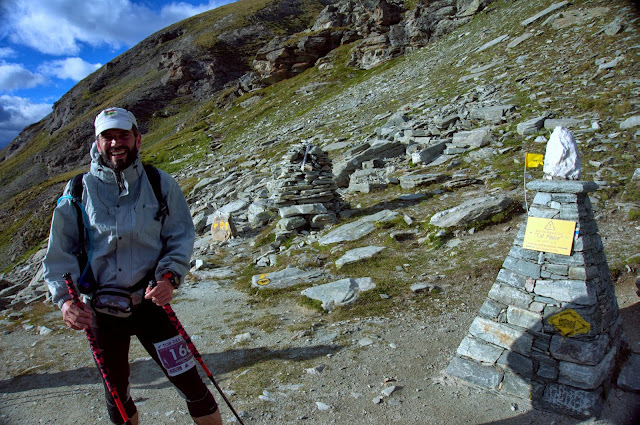 Best of all, he maintained his coveted position as a "senatori" — a competitor who's finished every running of the Tor des Geants. The distinction allows him to bypass the lottery for this race, which is becoming more difficult to enter. As a four-time finisher he swore he wouldn't go back, but that assertion didn't even make it as far as the finish line. He loves the TdG. I've always been impressed with Beat's endurance capabilities, but until this week, I'm not sure I fully appreciated the extent of how far he can take them. I've long held the belief that for most people, endurance possibilities reach much farther than we realize, and most of our limits are in our minds. I still believe this — in many ways, fear and self-doubt were my most limiting factors in PTL — but that experience, followed with my rough "recovery" week during TdG, cut my hubris about mind over matter down a few notches. A PTL-TdG double finish is a remarkable achievement to the few dozen people who care about these sorts of things, and Beat managed this in the same year he walked 1,000 miles to Nome. He does have a life outside all of this marching through the wilds of Alaska and mountains of Europe, but these adventures make him happy. They really do. I can see that now perhaps more than before, even as I grasp for understanding about *how* he can possibly make it happen. Ana also finished the Tor des Geants, arriving after 143 hours, 8 minutes, and 2 seconds early Saturday morning. She was 19th out of 38 female finishers, and 255th overall. I was really excited for her as well, and I also don't understand how she did it. 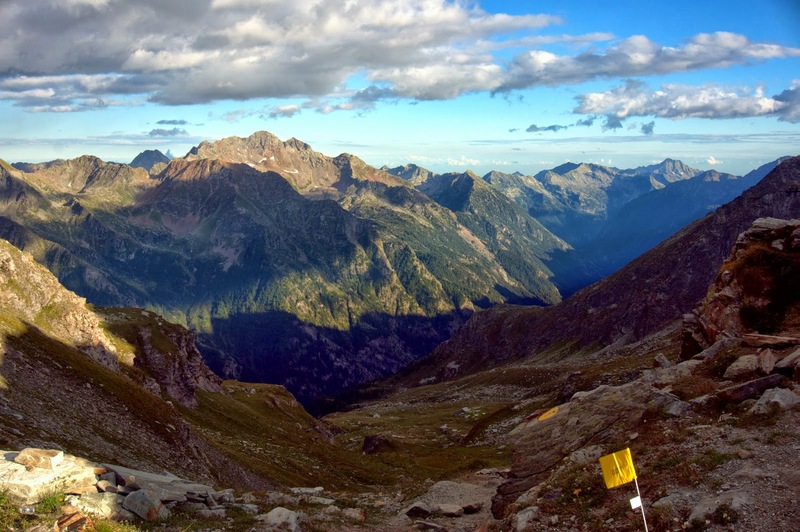 But the Italian Alps are incredible, and I think both of them agree it was worth it. As do I.
I feel horribly inadequate after reading about Beat and Ana. Just kidding. I think. Cool! Hope you make it through the lottery for TdG next year, Jill! Amazing! Just absolutely AMAZING! My hat's off to all three of you. Hi Jill, great report, let's hope we'll have a chance to meet in Courmayeur! Is your "future schedule" anywhere to be found? Linkage? Wondering when your next bike adventure will be for one. congratulations for your races ! it's amazing ! I am considering running either PTL or TDG. I can't do both, so if one, which one? Thanks for the comment. I haven't run TDG, I only crewed it three years for my boyfriend, Beat, and I've hiked several of the cols. But in my opinion, TDG and PTL are very different races. If you haven't done either, I would recommend trying for TDG first. 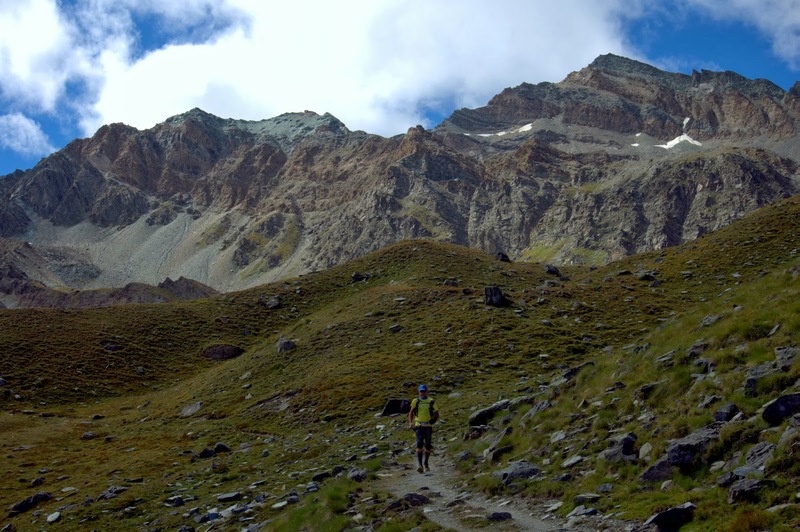 Take advantage of the stellar support and good trails for a 200-miler in the Alps with TDG before taking the plunge into almost-complete self-sufficiency, beginner class-five climbing skills, team dynamics, navigation, and, for most every team, deep sleep deprivation. PTL has much more in common with an adventure race than an ultramarathon. TDG is more like an ultramarathon.